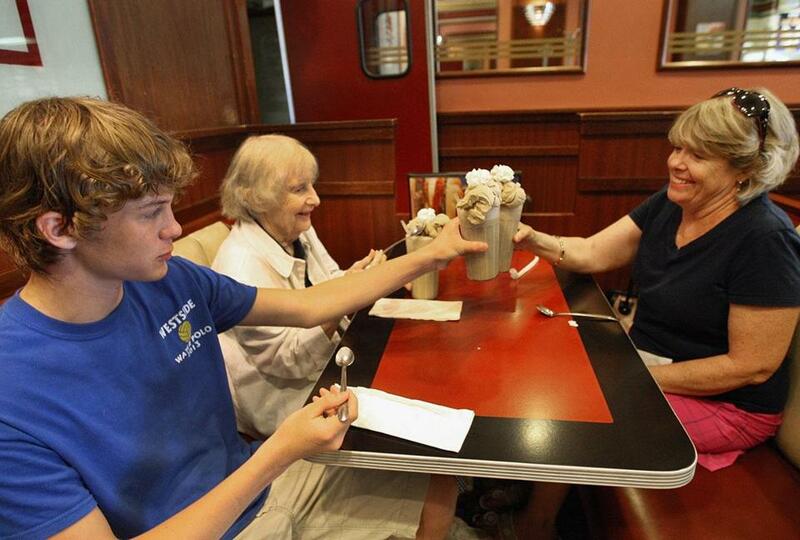 Beth Boggs (right), her son, Christopher, and her mother, Anne Thompson, are among the longtime customers sad to see the last Brigham’s ice cream parlors closing. Straight off a plane from Houston, Beth Boggs makes a bee line for the Brigham’s ice cream parlor in Quincy. Boggs, 53, says she became hooked on the store’s coffee ice cream sodas in the womb, when her mother, Anne Thompson, sometimes consumed two a day. Elbows up on the ’60s style formica counter, she leans over and watches the owner scoop into a tub of ice cream just as she did as a child. This time, her own 15-year-old son, Chris, is at her side. “You’re still Brigham’s?” she asks the owner, Dieter Lambauer, whose parents owned the store before him. The answer is that soon, just a year shy of Brigham’s 100th anniversary, the Boston ice cream institution will cease to exist anywhere but in grocery aisles. HP Hood of Lynnfield, which owns the Brigham’s brand, said earlier this year that it wasn’t making enough money on the 3-gallon tubs of ice cream supplied to Brigham’s parlors and would discontinue the line this summer. Under a licensing agreement, parlors must sell Brigham’s ice cream in order to use the company name. Now only two of the 10 surviving independent ice cream parlors still call themselves Brigham’s. The Quincy store and another in Arlington are holding onto the name until supplies of the brand’s ice cream run out. The final deliveries of Brigham’s ice cream tubs are expected later this month. Lynne Bohan, a Hood spokeswoman, said sales of the tubs initially declined in 2009 when the company that owned Brigham’s corporate stores, Deal Metrics of Baltimore, went bankrupt. Thirteen corporate ice cream parlors closed, leaving only the independent Brigham’s stores, whose sales, she said, have fizzled over the years. Lambauer tries to reassure his patrons in Quincy. He tells them that only the name on the sign will change, that the new ice cream will taste almost exactly the same and the recipes will remain unchanged. But longtime customers can’t hide their sense of loss. The company itself dates back to 1914, when the Durand Co. founded an ice cream and candy shop in Boston’s Post Office Square. Ten years later, namesake Edward Brigham opened his own ice cream and candy store, The Little Shop, in Newton Heights. According to company lore, Brigham became a neighborhood hero, serving up 5- and 10-cent cones and 20-cent sundaes made from closely guarded secret recipes. Brigham merged with Durand in 1929 and the company grew to more than 20 ice cream parlors and an ice cream plant by 1940, despite the Depression. 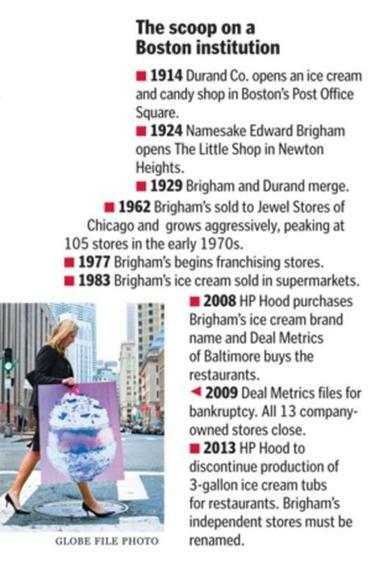 Brigham’s peaked with 100 franchisee- and company-owned stores in the 1970s, as it dominated the ice cream market and became a household name in New England. Tubs of ice cream went on sale in supermarkets in the early 1980s. Flavors such as “Reverse the Curse” and “Curse Reversed,” introduced in 2004, demonstrated the company’s ties to the Boston market. But even clever marketing couldn’t save the struggling store brand. Unsteady ownership, poorly placed stores, changing consumer tastes, and competition from premium ice cream brands such as Ben & Jerry’s and Haagen-Dazs led to Brigham’s fall to less than 30 stores in 2008, a year before the company went bankrupt. Now Lambauer is preparing to change the name on one of the last surviving Brigham’s restaurants, which his family has owned since 1978, on Beale Street in Quincy, to The Ice Cream Parlor. Customer Stacy Barisano frowned at the new name and said she was upset by the change. “It stinks because Brigham’s has good ice cream,” said Barisano, 39, of Abington. She agreed when her friend Dave Higgins, 39, who is also from Abington, added that Brigham’s flavor is better than anything out there, including Friendly’s. Others view the change unpleasantly because of a sense of nostalgia they associate with the brand. Francis Tevenan, 71, of Quincy joked that his car has stopped automatically each time it passed his hometown store since 1988. Tevenan and his wife, Geraldine, 70, sometimes stop by twice a day for their favorites: raspberry lime rickeys, twists, and butterscotch sundaes. Like most customers, the Tevenans have pledged their continued loyalty to the restaurants — new name or not — as long as the replacement ice cream tastes the same. Both the Quincy and Arlington stores are switching to ice cream from the Sugar Maple Creamery. Lambauer said he taste tested multiple brands and went with the one created in Wilmington to minimize any flavor changes for longtime customers. He believes the difference is nearly undetectable. Both brands have similar high butterfat content and even use the same vanilla flavoring from Madagascar. “The only thing I can do is get the best ice cream, and that’s what I’ve done,” Lambauer said. He explains the change to customers when they come up to the counter — lined with glass fishbowl jars full of M&M’s and Skittles alongside displays of colorful lollipops — and offers taste tests of the new vanilla for comparison. But some customers who have loved Brigham’s for decades detected the changes, regardless of how slight. Lambauer said the most noticeable difference is the size of the chips in the new chocolate chip and mint chip flavors. He said the new chips are twice as big and, to his surprise, several customers have complained. Taryn Luna can be reached at taryn.luna@globe.com. Follower her on Twitter @tarynluna.